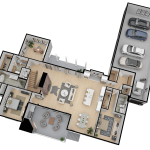 G&G Custom Homes wants to change the way you experience the homebuilding process using 3D Renderings, the latest technology in home building and remodeling. 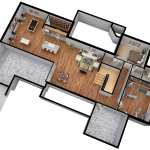 The technology of 3D Rendering is a tool that builders can use to help buyers that have a hard time visualizing their home based on blueprints and 2D plans. These renderings show the specific design elements homeowners have chosen in as clear detail as a photo. The planning and design process is completed upfront alleviating fears of the what-if’s or regrets that lead to multiple revisions, which add more time and money to the process. 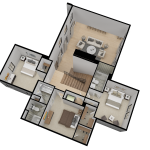 Your vision and plans are sent to the 3D designer to create a realistic visual of the exterior and interior, complete with your own furnishings. The process will save you money, time and give you peace of mind. Joe Garcia, President of G&G Custom Homes is currently using the technology to build a home in the Chatham Hills neighborhood in Westfield. The plans have been developed, designs meticulously crafted and the renderings provide a checks and balances with photorealistic 3D plans. “We gave the designer the roof color, manufacturer, the stone, the color of the windows, landscape design, and the client will know exactly what the house will look like,” Garcia says. Similar to the exterior process, Garcia says that the 3D Interior Renderings offer a vantage point of looking down into each room. “We also gave the designer the manufacturer and color of the wood floor, the color of the walls, light fixtures, and, for this spec home, they told them what furniture and how to place it,” Garcia says. The level of detail in these renderings leaves little to the imagination, and that is what makes the building and design process more efficient and cost-effective for the homebuyer. Garcia knows that the building process can be a great experience with the use of this technology and can offer that peace of mind by reducing the number of revisions up front. Being entrusted with someone’s vision of their dream home is a privilege. Garcia is committed to working with clients to build the home of their dreams and using 3D technology means your vision for your new space can be brought to life exactly as you imagine it. For more information about this home or building a home with G&G Custom Homes, call Joe Garcia at 317-418-7665 or visit them online at ggcustomhomes.com.